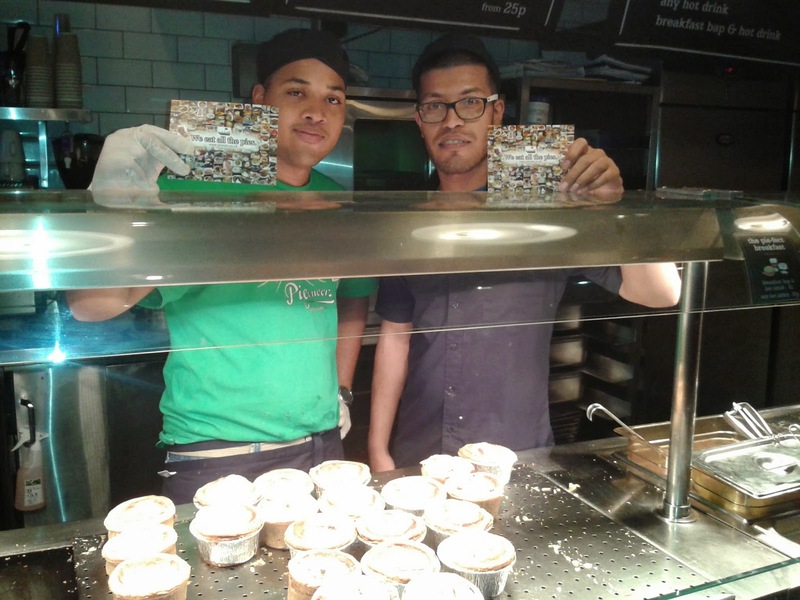 Urban Pie are one of our many friends in the pie world. We have been there many more times than the 4 previous pie reviews indicate and they were kind enough to also blog about us! They called us 'pie experts' back in our early days of 2010. Aww, thanks guys! Perhaps this kind sentiment was in part down to our acclaim of this 'fast-food' pie format. It was our first taste of such a thing, before we discovered similar such ventures in London. Pierateers RAS and SJL had a quick visit between changes of trains at Birmingham New Street. The place had new options since SJL’s last visit with new veg and potato wedge options. 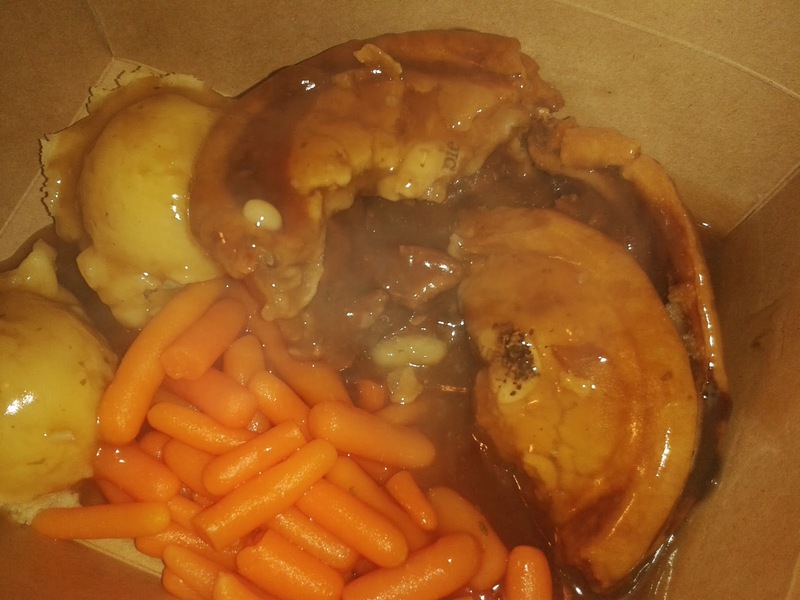 SJL opted for the Angus Steak and RAS took on the Lamb, Potato and Mint pie. The staff were very friendly which really helped to make a nice atmosphere. 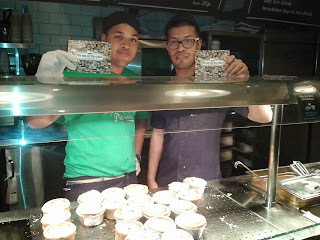 They even posed for a Pierate/Urban Pie promo photo. However there was no time to waste, as the Pierateers had trains to catch! They were therefore fully capitalising on the take-away option of these pies. Sealing up their pie boxes, they travelled to the train station and ate their pies on the respective trains they were catching – not the easiest way to eat pie smothered in gravy but sometimes you need to eat pie on the go! Both pies passed their TRAINing exercise with flying colours! Pierateer RAS actually finished his pie off at home – eating the remainder of his pie from the box in front of the Box! But enough of that – let’s dig into the pies! 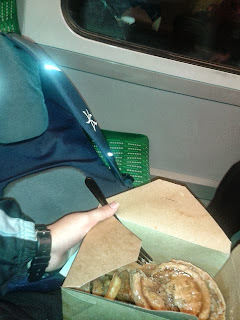 I am a big fan of the Urban Pie pastry because it does hold its structure well. The pies look fantastic and what I consider proper pies to look like. It also maintains some crispiness on the outside while being gooey on the inside. Unfortunately this time I also had some very thick pieces of pastry on the sides. These were a bit too doughy and hence the pie lost score. I am sure that this isn't representative though as I have had a number of Urban Pies before. 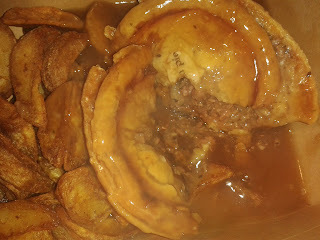 The meat and gravy was classic steak pie fare. The taste of beef was intense and while it didn't do anything unique, everything it did do it did very well. Coming as a good value meal it was another Urban Pie experience I really enjoyed. It was just a shame it had been so long between visits! The pie was certainly packed to capacity, with crisp top pastry which comes as standard at Urban Pie. The base and side pastry were a little thicker than ideal but it did hold the content in well. The content itself was interesting. Certainly anyone who knows Pierateer RAS well will know he has been banging on about having a “shepherd’s pie pie” for a while now – i.e. a lamb mince and potato Shepherd’s “pie” fully encased in pastry to actually make it a proper pie, not just mince meat covered with potato! Well this was pretty much that idea, with minced lamb, small pieces of potato, a bit of carrot and onion and a minty gravy. A tried and tested flavouring of many a Shepherd’s “pie”, the flavours were very good – slightly too minty in my opinion but certainly flavoursome. 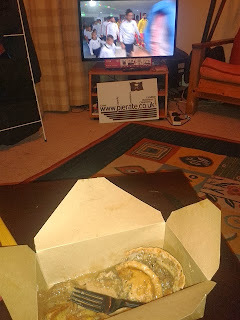 However my natural reaction to eating this pie was that it just wasn’t as good having minced lamb than proper meaty chunks of lamb, which you get in the Lamb and Rosemary pie here. Also, the addition of potato to the filling naturally meant there was less capacity for meatilicious content. I applaud their effort at trying something different, but will certainly stick to the Urban Pie Lamb and Rosemary next time I visit!